Recent years have seen a rise in games that are more along the lines of interactive fiction; titles like Dear Esther, Gone Home, Virginia, and Firewatch keep our interactivity with the environments and the people in them to a minimum and funnel us so it can tell us its story but at a pace that suits us. Following on from this another type of book gets the videogame treatment – Where’s Wally. Brought to life in the late 80s, Where’s Wally (Waldo in the US) had kids enthralled as they turned the pages to see an image spread full of detail and people and were tasked with finding the bespectacled, stripy jumper wearing history nerd and his companions. Hours would be spent and kids would band together to scour those pages, they were determined to not let Wally beat them. 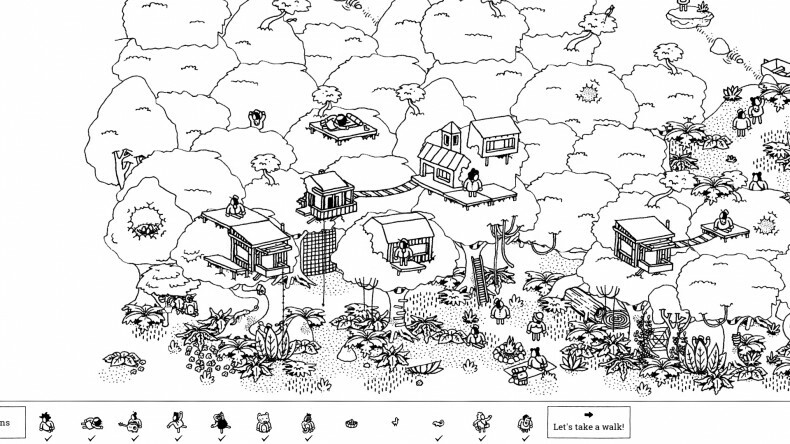 Thirty years later the desire to find things within hustle and bustle still burns within us, and that’s where Hidden Folks comes in. It doesn’t have the colour of the Wally series, but the places that Hidden Folks drops you are packed with a multitude of set dressing to make it difficult to seek out that which you are tasked to find. As well as this it’s all drawn in a monochrome line art style that makes every character look identical and makes items easy to blend into their surroundings; this certainly ramps up the challenge considerably. As if that wasn’t enough, the locations are packed with interactive elements; doors, windows and tents can be opened, rocks and satellite dishes can be moved even plants can be watered and nurtured to grow to make the thing you’re looking for appear. Reminding yourself of this is key as it’s all too easy to spend several minutes looking for something only to accidentally move an item and reveal what you were looking for. You’re not left alone in your quest in looking for needles in haystacks, along the bottom of the screen is the list of what to find for your current locations and finding a set amount of them allows you to progress to the next place. Tapping on the items in the list gives you a cryptic (and some not-so) clue as to the person’s location leaving you to then find where the hint is pointing you so you can track it down. Unfortunately sometimes these can be a little too unhelpful and while you can be staring at one place for a long time you’ll still be none-the-wiser as to what you need to do to be able to select them, for instance on one map I had found the person I was after but the game refused to register my finding, after a bit of random tapping around I managed to trigger the event that eventually allowed me to cross that one off of the list. Additionally there’s some great sound design that sounds like it was all created by someone standing in front of a microphone making noises with their mouth. Futile taps are met with a *pff*, monkeys holler, snakes hiss, birds screech and it’s localized too, so as you move the camera around animals in the area will be heard while moving to areas with cars will have them drown out the nature noises, and it’s hard not to love the little ‘ding’ that comes up when you’ve found something. And, well, that’s about it. There’s no reward for your endeavours, no unlockables, and no fanfare; it’s just you and your desire to see everything on the list checked off, so what you get out of Hidden Folks basically depends on what worth you get out of checking off objectives, but that was all we had with our adventures with Wally, and there’s nothing wrong with that. 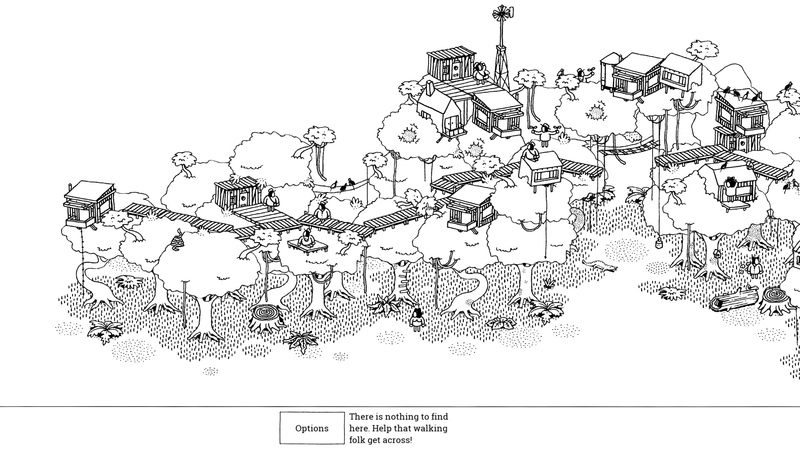 Hidden Folks is a little obtuse at times but otherwise it’s delightful and compelling.